Could the traditional seesaw totter between lessors and lessees of wireless sites be leveling itself out? Balanced markets exist when buyers and sellers are on an equal footing, with neither party having a significant advantage over the other. With wireless, balanced market-conditions would exist when the lessor and lessee have an equal amount of influence. Historically, wireless carriers have had more negotiating leverage compared with property owners or lessors. The carriers knew what it would cost them to construct a typical wireless site, the length of time to recover that investment, and what they are paying in rent for other sites in their network. Yet owners, by and large, did not have any of this information. Without a market vehicle to check rent offers (like classified ads, multiple-listing services, commercial brokers or appraisals), owners often accepted the first offer presented by the carriers—set at deliberately-low amounts that favored the lessee. Although wireless leasing is still not as open and porous as the markets for others forms of real estate, the supply of new site leases is beginning to slow down in metropolitan areas with established wireless infrastructure. In San Diego, for example, the four major carriers (Verizon, Cingular/AT&T, Sprint-Nextel and T-Mobile) established their core wireless networks a number of years ago. For these companies, construction is mostly limited to site upgrades, or infilling with smaller sites to fill in coverage gaps. Only one carrier (Cricket Communications) is aggressively building out their core network at this time. Recent numbers from the Cellular Telecommunications and Internet Association are indicating that the supply of cell sites may be leveling off, after more than a decade of exponential growth. In fact, for the last three years, the annual rate of growth dropped below ten percent for the first time in several years, averaging 6.28%. In 2005, the number of sites nationwide increased by only 4.5% from the previous year, and 2006 reported a 6.5% increase from the 2005 total. Since a key precursor to a balanced market is the equalization of supply and demand, these early cell-sites totals may indicate that supply and demand are trending closer together. This is a marked shift from the early days of wireless site-leasing, when carriers could find plenty of opportunities to negotiate favorable lease terms—and could mean that balanced market conditions are not far off. Telecom cells and the cells of your skin are not as different as you might think. In both contexts, cells serve as basic building blocks, from which larger organisms can be created. Within a wireless context, cells are both a basic building block for a larger organism (the cellular network), and an agent for social interaction. Telecom-cell growth has, and continues to, spread across this country in irregular ripples, from population centers to rural areas, and from business cores out to the “burbs.” At its simplest, cell growth goes through distinct stages of development. area in question is “filled in” with wireless coverage. 5.) Renewal, as older cells are replaced with newer ones. Just as with skin cells, as the weave of wireless fibers grow closer together, the gaps of coverage in between these fibers become smaller. In turn, the cell sites being built to fill in those coverage gaps are also getting smaller. Although a cell site’s radius depends upon its surrounding topography and its capacity to handle calls, cell sites in rural areas generally have a radius between five and eight miles, and cell sites in urban areas typically have a radius between two and five miles. As call volume increases within a given cell, demand for frequency reuse (in other words, the cell’s ability to handle more calls) will also increase until the cell reaches its maximum processing capacity. Therefore, to preserve wireless coverage and to provide for future growth, carriers are breaking up larger sites into smaller ones. Depending on the specific topography of the area to be covered, a handful of smaller sites at lower elevations could be substituted for one high-elevation site at capacity. Our need to share information is analogous to the flow of blood for skin cells. As Dr. Emarine pointed out, increased blood flow can lead to faster epithelial-cell growth. Consequently, increased telecom-cell growth is usually the end result of an increased need to share information. Can cell phones and "smart" keys co-exist? If you've been fortunate enough to have purchased a car within the last few years or so, chances are it came with a "smart" key, which has a computer chip embedded in its plastic fob. These intelligent keys have been designed to allow keyless entry; you can enter your car (or, with some models, even start it up) without taking the key out of your pocket. However, here's something to keep in mind. Don't keep your cell phone in the same pocket. A statement released May 23 by Nissan North America indicated that some cell-phone models can interfere with the wireless functionality of the smart key if the phones are within an inch of the chips in the plastic fobs. Although Nissan hasn't received any complaints from customers, they will be introducing a revised I-Key that cannot be interfered with. The Toyota Camry is available with the advanced key as an option starting with the 2007 model year. The Nissan Versa is available with Intelligent Key as an option on the 2007 SL model. When it is a portable cell site. Many municipalities use "cows," or cellular-site on wheels, to establish temporary coverage for an area, or to augment the coverage for a special even when call-volume loads would be higher than normal. A typical "cow" consists of a 30' to 100' telescoping monopole, equipment cabinets and power generator--all mounted to a trailer (see photo). In October of 2003, when the Cedar fire destroyed much of the communications infrastructure in San Diego's East County, a number of private carriers, working with local government, brought in COWs to establish emergency cellular service for the firefighters and emergency-service personnel. 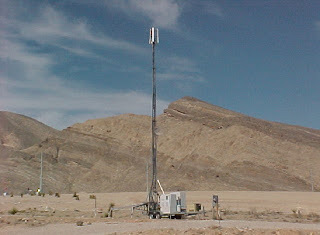 Companies like the Avisar Group (www.avisargroup.com) have developed their own market niche by providing truck and trailer-based cell sites to public and private agencies. Sometimes, a COW can be a COLT. COLT stands for cellular-site on a light truck (or van) and were critical in providing communications for portions of New Orleans following Hurricane Katrina, and in lower Manhattan in the aftermath of 9/11. Missouri and Kansas currently have an agreement in place with a local cellular-phone provider to provide COW services in the event of an emergency. Under this agreement, the carrier could augment or replace damaged communications lines with their portable trailers in less than 24 hours. This type of public-private partnership is being considered in several other budget-strapped cities faced with the challenge of upgrading older emergency-communications equipment, but lacking the funds for permanent installations. In 1998, when Puerto Rico was hit by Hurricane Georges, more than 490,000 landlines were down or had no intra-island long-distance service. CellularOne Puerto Rico, one of three wireless carriers serving the island, reported that by the next morning after the hurricane, more than 85% of their wireless network was damaged. However, by using COWs, the carrier had 75% of their network back online in three days, and 90% in less than a week. As Chris Wilson reports in an April 17 article for US News and World Report, man-made tragedies like the Virginia Tech incident can also strain a local wireless network, as frantic phone calls flood into and out of the system. Wilson writes that "companies build enough technical capacity into their systems for only a 2 percent increase over normal levels before calls start getting dropped." I think the perfect cell phone was the Star Trek Communicator. Think about it. It could communicate over insanely long distances, and under any kind of weather condition s. It worked inside buildings, in caves and tunnels, anywhere. A couple of new phones on the market now are coming closer to offering the type of universal communication that was previously only available in science fiction. In the fall of last year, Samsung introduced its first WiMax-enabled cell phone. This do-everything phone has three hinged pieces, which when opened fully, offer a full QWERTY keyboard, 5-inch WVGA screen, and a 30-GB hard drive, plus the usual extras like an mp3 player, camera, and video. If you'r e tired of squinting at the tiny letters on your cell-phone's display, then Telecom Italia has a phone for you. Working with Polymer Vision, they have introduced a cell phone with a unique rollable display. As shown in the photo to the left, the display is larger than the handset itself, and offers readability similar to printed paper. Rollable color screens are planned for future models. As part of its multi-million-dollar WiMax gamble set for a 2008 launch, Sprint recently introduced its first WiMax-enabled phone, as well as a sports and entertainment "network" known as Sprint Power View with daily video news clips. Access to the network will be on a subscription basis, with basic voice packages starting at $30 a month, with unlimited access to Power View as an add-on cost of $15 to $25 per month. In addition, Sprint is exploring a number of avenues to bring WiMax coverage indoors. According to Bin Shen, Sprint-Nextel's VP of Broadband, in an article for unstrung.com, Sprint "is examining a number of WiFi options--from small cells that link to the Internet over Ehternet cable to more standard cellular-style distributed antenna systems. 'It depends on the situation,' says Shen. 'There is no kind of uniform way that we can do this.'" However, if Sprint is able to strike gold on some of its indoor WiMax claims, then it could become a significant competitor to traditional WiFi providers--since Sprint could offer blazing-fast connections three to five times faster than WiFi at the same cost. Other new phones offer even more goodies. For example, the Nokia 6131 can be used as a wireless credit card, transferring payment information to pads at certain retail stores. Other "smartphones" will have Windows-like interfaces, which will allow users to run several applications at the same time, without having to close any of them. It seems as if every week another new application surfaces for microcells--those small wireless cell sites you might see on light poles or traffic lights around your city. Thanks to the use of radio-frequency chips (or RFIDs), fans supporting their spouses or loved ones in 5Ks or marathons can now receive up-to-the-minute text messages and emails on their cell phones, while they wait anxiously on the sidelines, or pace in the comfort of their living rooms. The hosts of the San Diego Marathon began rolling out pressure-sensitive mats at six locations along their 26.2-mile route in 2005. Then, they would give runners RFID chips which attach to their shoes. As the runners pass over the mats, a transmitter inside the chip sends a unique ID code to the nearest microcell antenna, which then routes the ID and the runner's elapsed time to a central database, which can then send out text alerts to designated people specified by the runner during their registration. From the time a runner hits the mat until a text message reaches your cell phone will be no more than four seconds. During the Boston Marathon on April 16th, fans will be able to follow up to five runners at a time using laptops with wireless modems. In 2006, approximately 10,232 runners (or about half of the total number of participants) signed up for on-line alerts. Fans following the Chicago Marathon can duck into designated Starbucks cafes along the race route, where volunteers with laptops will be able to check on the current status of any runner in the race. New York has been using similar technology since 2000. Organizers of the Houston Marathon offer RFIDs plus an interactive online map that can be used to track a runner's progress. The marathon's web site also offers a detailed post-game statistical report for runners and video clips of their efforts. The costs for this high-tech service vary widely, and depend on the location and the number of participants in a given race. Runners can pay only $1 to $2 for an RFID chip (the cost is usually added to their race-entry fee), or as much as $20,000 for a more elaborate tracking system. Can coffee be bad for your cell phone? Definitely, if you drop your RAZR or PEBL into your frappaccino. You're at a conference with three hundred strangers, and you're anxiously checking your watch, waiting for the speaker to announce the morning break so you can call your office to check your messages. Finally, the speaker says "It's 10:30. Let's take a coffee break and reconvene in fifteen minutes." You follow the rush of people out into the hotel lobby, and you quickly whip out your phone, only to see a message flash across its cellular screen: Denial of Service. It seems that you weren't the only one wanting to make a call. A number of other attendees were trying to do the same thing, resulting in hundreds of cellular phone calls trying to be placed from the same location, all at the same time. This spike in useage overloads the local wireless network, causing it to crash--hence the Denial of Service beacon you see flashing on your phone's display. That's how, in the end, coffee can be bad for cell phones. However, it is exactly this type of situation that prompted the need for smaller cellular base stations--picocells, as they're called--to serve busy areas of population clusters like hotel conference rooms. They are also used in airport concourses. Early airport installations began in 2000 in high-tech locales like Seattle, Austin and Dallas. Today, about 100 North American airports have wireless coverage. Back during the dot-com boom, Nokia installed Wi-Fi (wireless Internet) service to airports from Ottawa to Vancouver and Denver without having a permanent operator in place to handle the actual service. Cellular technology is converging to a point in the not-too-far-off future where our wireless calls will switch between the outside CDMA or GSM cellular network to an in-building VoIP (voice over the Internet Protocol, like Skype or Vonage) network seamlessly. In fact, there are phones on the market now with WiFi capability. T-Mobile's new phone called the Dash comes equipped with WiFi, enabling it to connect to any of T-Mobile's 7,836 hot spots around the country. In the future, there will be more convergence, as more services are added to cell phones, eventually reaching a point (probably around 2025) when wireless connectivity will seem mundane. We will be able to wirelessly communicate, share, chat, and download pretty much whenever and wherever we want. But in the meantime, the clock is ticking on your coffee break, and you've got business to attend to. You walk out to the street, and notice that you now have five bars, indicating a full-strength signal. Put that coffee away. It's time to get busy. If you're like me, you enjoy reading articles about how things work--the behind-the-scenes details that often are lost to most of us unversed in technical or engineering lingo. Tracy Wilson, staff writer for the How Stuff Works web site has just written an excellent article describing how municipal Wi-Fi works, complete with very clear and easy-to-understand illustrations. Worth the time to check out. I'm not ashamed to admit it. I'm 40 years old, have a mortgage, job and obligations, and I still believe in magic. I'm a huge Harry Potter fan, and I read each installment with the same wide-eyed wonder as I might have done when I was ten. Arthur C. Clarke once said in 1961 that "any sufficiently advanced technology is indistinguishable from magic." I believe that is the case with wireless. Imagine for a moment if you could go back to the time when telephones were still newfangled novelties. Imagine trying to explain to an average man on the street that, one day, we would be able to talk to anyone, anywhere in the world, whenever we wanted, at any hour of the day. That man on the street would say, "Why, we can do that too, with this new device from Alexander Bell." Then you tell him you'll be able to do it without wires of any kind. You'll be able to pull down conversations, data, pictures and movies out of thin air--just like that man from the past could receive radio stations from distant lands. "Why, that's magic you're describing," that historical man might say. And yet, this is the technological world we take for granted now. We can use cell phones and PDAs to retrieve all sorts of information, even settle debates over arcane trivia (Who was JFK's running mate? or What was the first wild-card team to win the Super Bowl?) with a couple of quick thumb-taps on a BlackBerry. Our cell phones have evolved into so much more than mere communication devices. They are alarm clocks, music players, and digital wallets. They are road maps and talking museum guides. They help us monitor our children, our weight, our appointments, and our goals. In short, cell phones have become a remote-control for our lives, electronic Swiss Army knives that are as indispensable as our driver's licenses. In short, we are using and sending more information through the air every day, and wireless carriers are trying to keep up with our increasing thirst for wireless knowledge. Over the past few years, there has been an ongoing debate among some in the wireless industry as to which communication standard (CDMA or GSM) would emerge as the new global default. In the end, this debate is about the same as deciding which Dixie cup to use for a Big Gulp-sized thirst--neither one can handle the expected growth. We can split up cell sites into smaller and smaller units to ease the load on our overburdened wireless networks, but that will only work for so long. Eventually, a new standard will have to take hold (WiMax, or some other parlance to be invented later) to keep up with our desire to access anything, anywhere, anytime. This is the behind-the-scenes engineering that makes technological magic possible. In a blog posted March 7th on Outlook4Mobility.com, Andrew Seybold offers a suggestion for the rest of us--waiting for technological advances requires patience. We should not be too quick to throw out the old copper cables just because they are old; there is still a lot of life (and magic) left in those lines. Does the fact that we will have new WiMAX, AWS and perhaps 700-MHz network operators coming to the wireless party make a difference? I'm sure it will, but it will take time. Even then, many won't understand the truism that the wireless industry understands so well: "There is not enough radio bandwidth in the world to convert all of our communications to wireless. Wired will continue to play a very important role as we move forward." The wireless industry is a great environment in which to work. It is becoming more competitive and the rules of engagement are changing rapidly. Wireless is one of the fastest-growing industries of all times, and as it morphs into whatever is next, it's fun to be along for the ride." It all still seems magical to me. With approximately fourteen U.S. cities testing the waters of municipal Wi-Fi, the next icon of communication may very well be the humble corner lightpost. Small “microcell” antennas, some no larger than a pack of cards, are mounted to lightposts as a means of offering municipal wireless-broadband service. These “smart” poles would be used in a “mesh” fashion, with wireless signals passing from pole to pole until it reaches a conventional monopole or lattice tower. Then, the signal would be relayed to a transmitter with a backbone connection (fiberoptic, satellite, or cable), where it would be sent out to its final destination. Users of these “smart” poles could include residential customers, public parks, emergency service providers, or city workers. Flash memory installed inside the poles could store information on local retailers, and blueprints of buildings accessible by firefighters in the event of an emergency. One San Jose-based company, NextG Networks, works with municipalities to build microcell networks that would fill in coverage gaps created by existing wireless networks—either because of terrain challenges or competition between carriers. NextG’s technology allows them to sublease the same microcell to more than one carrier (think T-Mobile or Sprint), through the use of a special type of software known as an operations-support service (OSS) that allows traffic at each site to be prioritized and billed to different parties. Instead of thinking about OSS as a type of software, think of it like a universal translator, with the communications standards used by each carrier (GSM or CDMA) as languages, as different from each other as French is from Russian. Just as a Parisian could not communicate with a Muscovite without the aid of an intermediary, so too a T-Mobile cell site could not process a call made from a Verizon subscriber. With OSS playing the role of a translator, now any microcell can handle any call, regardless of the call’s language. Kurt Mackie, Managing Editor of Broadband Wireless Business, states that mesh networks offered by companies like NextG or EarthLink offer a greater amount of flexibility than conventional wireless networks—both in installation cost and ease of use. Because of their small size, microcells can be enclosed inside virtually any cylindrical enclosure at a cost of less than $1,000 per pole (versus an average cost of $30,000 to $50,000 to construct a typical 30’ to 40’ tall monopole). The power requirements for these smaller wireless sites are also a fraction of their larger single-tenant cousins along highways and interchanges. In fact, a Scottish university is currently testing solar panels that could be used to power a streetlight and a Wi-Fi or Wi-Max antenna array enclosed inside. Intel, with support from Cisco, Dell, IBM and other companies, has begun an initiative called “Digital Communities,” created to educate city leaders on ways they can use their Wi-Fi networks as a commercial service by selling access. City officials could also gain additional revenue by charging roaming fees to non-city employee visitors. In another C-Net article written by Michael Singer, JupiterResearch analyst Julie Ask offers this suggestion. “Cities can use Intel’s investments to save money, Ask said, because support services for city employees in the field can be provided more efficiently using wireless communication.” City employees can wirelessly roam to locations in other cities for free, simply by entering a pre-established username and password. This innovation would allow municipal employees to be more effective and productive, while encouraging cooperation between cities. Cities have the potential of pulling more revenue out of their Wi-Fi networks by charging visitors an access fee. Once a city makes the initial decision to charge visitors or not, their access could be handled by a simple three-step process. 3.) Lastly, the visitor would enter their pre-established username (based on their home city) by means of a customized log-in screen. Cities can also use Wi-Fi networks to issue real-time announcements (like Homeland Security bulletins) to every city resident tapped into the network. City officials can then tie in other services (like parking-meter control, traffic management, and utility-meter reading) into their Wi-Fi network to increase productivity, both for themselves, and for its citizens. In the future, municipal Wi-Fi networks could be opened up to any mobile subscriber, simply by sending a text message to a dedicated phone line, known as an 80211 shortcode. Metrofi, of MountainView, Calif., is a wireless reseller that has established broadband networks for Cupertino, Santa Clara and Sunnyvale, California. Residents in these areas enjoy free Internet access from anywhere in the community. On the state level, Michigan has wholeheartedly endorsed the possibility of municipal Wi-Fi networks. The state has targeted broadband as a crucial tool in job retraining and education. In a White Paper titled “Enabling the Future of Wi-Fi Public Access” dated February 2, 2004, the WiFi Alliance cited a survey done by Boingo Wireless to highlight the vast untapped potential of Wi-Fi. At the present time, California has the greatest number of Wi-Fi sites, or “hotspots” as they’re also known. By 2007, according to the WiFi Alliance (www.wi-fi.org), there will be approximately 530,000 hotspots across the country. There are a couple of things city administrators should keep in mind when considering muni-WiFi. The first would be not to act too hastily, simply to be the first in your area to offer this technology. Most wireless resellers I spoke with strongly advise cities to do their homework before beginning negotiations. Another important consideration is to make sure your proposed network is fast enough to be of practical use. In New Orleans, their Wi-Fi network (built with equipment donated from Intel and local ISPs) will operate at a 512-kilobit speed as long as the city remains under a state of emergency, and will then be reduced to 128-kilobits per second in accordance with state law, which restricts government-owned Internet service. In response to widespread outages following Hurricane Katrina in August of 2005, the city introduced their Wi-Fi network in the central business district and the French Quarter in December, and expects to be city-wide within a year. Thirteen other states have passed similar laws restricting government-owned Internet service, and other states are expected to consider similar restrictions. The downside is that New Orleans’ new WiFi network may be too slow to be of any use. For a while now, a number of ISPs have offered dial-up Internet access at speeds of approximately 392 kilobits per second as an upgrade to the old, notoriously-slow 56-kilobit conventional dial-up means of access. Yet this level of connection is neither cable or DSL, which offer 3-megabit to 5-megabit access speeds, more than 8 to 13 times faster than New Orleans’ WiFi network. Residential users of Philadelphia’s Wi-Fi network, on the other hand, can reach the Internet at one-megabit per second, for approximately $16 to $20 per month. Metrofi’s service also promises one-megabit access. The fastest WiFi connection tops out at 54 megabits per second. And the newest kid on the block, WiMax, promises speeds of up to 70 megabits per second. Wi-Max, short for Worldwide Interoperability for Microwave Access, works similar to Wi-Fi, but on a much broader scale. A single Wi-Max tower could provide coverage over a 30-square-mile area, whereas Wi-Fi antennas have a very short broadcast range of a couple of blocks or so. With Wi-Fi, a city would need to have several lightpoles installed just to cover a downtown zone. Under WiMax, a city could pay for one base station that would cover an entire financial district. The companies maintaining the base stations for the cities might offer unlimited access for a monthly fee, or a “pay as you go” plan that charges on a per-minute or per-hour basis. In May of 2005, a Seattle-based firm installed a WiMax antenna at the top of the Space Needle, providing a six-megabit wireless Internet signal over a five-square mile radius. City officials agreed that this is a significant upgrade to the 1.2-megabit, T-1 connections currently used by most local businesses. In a recent online article about an upcoming release of 1700-Mhz spectrum later this year, Andrew M. Seybold of Outlook 4Mobility offers another opinion for wireless development in metro areas. “What I would like to see is a consortium of companies that come together to build a true nationwide network shared by small, medium and large resellers (like Metrofi, NextG and Earthlink) offering both voice and data services. “There are two ways in which this could happen. The first would be for a group of companies to pool their bids for specific frequencies and obtain every license nationwide. An example of one type of USB personal server is the Realm Key by Realm Systems (www.realmsys.com). This flash drive, also called the “Mobile Microserver” by its manufacturer, works just like a stand-alone PC. Contained within its tiny package are an embedded operating system, 400-MHz processor and 256 megabytes of flash memory, with an expansion slot for another gigabyte. According to Realm Systems, the device will include e-mail software similar to Outlook, full Web browser, file backup and management tools (including firewalls and virus checkers), and a full office-productivity suite similar to Microsoft Office. There will also be slots for a Wi-Fi modem and other customized features. Once plugged into a USB port on a host PC, a software wizard will provide step-by-step instructions to sync with the host PC, as well as tying into any other networked PC, PDA or other storage device connected to the Internet. Realm Systems claims their product will be compatible with Windows, Macintosh and Linux desktops. One could describe technological innovations like OSS or microcells as hurdles laid in the path of a metaphorical runner. Each time the runner clears a hurdle, his sight is set on the next one before him. With the adoption of these new innovations in wireless communication, we (as a wireless community) have also cleared a type of hurdle—the differences between our communications standards. If that is so, what will be the next barrier in our path? We might find the answer from a seemingly unrelated source—a quote in a book about physics. In his book The Dancing Wu-Li Masters, Gary Zukav includes the following quote from physicist Henry Stapp. This is true from an information-sharing context as well. It might be easier to think of ourselves as a community of individuals sharing voice and multimedia files with other individuals in a series of isolated interactions. Instead, perhaps we could consider that the data we are sharing wirelessly becomes part of a “data cloud” enveloping all of us—as ubiquitous as the air we breathe. Then, we may be in a better position to study the web of relations we make in this wireless world, and we will be better able to “see” the next technological hurdle down the road. Your cell phone’s ringing. What’s the first word you might say? Yet, the word Hola can also be used as a reminder of the pattern behind cell-site development. As a mnemonic tool, its letters would stand for the following. With early forms of communication, height was always an advantage, since it allowed the sender to convey his message over the greatest distance. The Romans used mountaintops to post simple signs, whereas native tribes would communicate using puffs of smoke, drumbeats, or flashes of light. Back in the 1950s, as long-distance telephonic traffic grew, AT&T (when it was still known as “Ma Bell”) used height to its advantage, by building microwave towers on remote mountaintops. These sites acted as the “backbone” for long-distance communications—until fiberoptics rendered this system obsolete in the 1970s. The higher transmission speeds promised by fiberoptic opened the door for the first wireless-communication standard, based on analog transmission. As analog networks were introduced across the country in the 1980s and early 1990s, the HOLA pattern emerged again. Older microwave sites were converted first, to provide a new backbone. Then, carriers supplemented these high-elevation sites with monopoles at lower heights. As call volume increases within a given cell, at some point even the tallest telecommunications tower will reach its processing limit. At that point, carriers generally have two options: increase the cell’s height (and power), or split the cell up into smaller areas served by towers or poles of lesser height. Flashlights provide a handy means of illustrating cell-site development. If I want to illuminate the area around where I’m standing, I’d find the brightest light I could find, and put it up as high as I could reach, so that its pool of light would disperse over the greatest distance. Alternatively, I could cover the same area with smaller lights closer to the ground, arranging them so that their beams overlapped each other—leaving as few dark areas as possible. As towers reach their processing limit, smaller sites are built to handle the load. 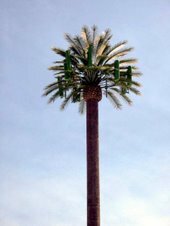 Since its introduction in the early 1990s, digital cell sites have gotten progressively smaller. Two of the latest categories of sites to emerge have been described below. Microcells generally consist of one to two panel antennas mounted on street signs, light standards or utility poles. In southern California, sites like these are being used by carriers to fill in coverage gaps in residential communities. They are also used to cover small stretches of road that could not be covered practically with a larger site at a higher elevation. Picocells represent the latest in telecom-cell development. With equipment small enough to fit inside a suitcase, and antennas the size of a deck of cards, these cells are being installed in hard-to-cover, high-volume areas like airport concourses, shopping malls, subways and tunnels. Therefore, as population density increases, so does the density of sites. As the density of sites increases, their broadcast radius decreases, as shown below. (Note): Although a cell site’s radius depends upon its surrounding topography and its capacity to handle calls, cell sites in rural areas generally have a radius between five and eight miles, and cell sites in urban areas typically have a radius between two and five miles. In the U.S. alone, more than 690,000 cellphone calls are made each second—more than one billion calls per day. According to the CTIA, there are approximately 184,000 cell sites in this country struggling to process this flood of information. The demand for more bandwidth to handle the transmission of higher levels of data (from analog calls to digital calls, text messages, photos and MP3s, to DVD-quality video) puts increasing pressure on engineers to develop new communication standards to better accommodate the volume of data flying through the air. When a new standard is introduced, the HOLA pattern repeats itself: start high to cover as broad an area as possible and then subdivide into smaller cells as call-demand increases. This is illustrated in the following chart. Chart created by The Heath Group. At present, we are in a transitory state between CDMA/GSM and full-fledged adoption of WiMax. While CDMA and GSM continue to battle for the title of universal standard, in the end it may not matter. Neither protocol can keep up with our thirst for bandwidth. It's a little like arguing which Dixie cup to drink out of when you have a Big Gulp-sized thirst. The latest generations of broadband wireless, including prototypes of WiMax, may satiate this demand for now. Or, at least long enough until the next standard is developed. Since most Wi-Fi antennas are already low to the ground (30 feet or less in most cases), the only practical remedy for seamless coverage is to broadcast from a higher elevation, and at higher speeds. At the present time, we are approaching a transition in digital communication from CDMA and GSM to the higher bandwidth and speed promised by WiMax. In terms of bandwidth, WiMax portends the ability for several users in the same area to watch DVD-quality video on the same channel at the same time. In May of 2005, a Seattle-based company installed WiMax antennas and equipment atop the Space Needle, 605 feet above the ground. At this height, the Space Needle site will be able to transmit wireless Internet signals over a five-square-mile radius, at speeds more than sixty times faster than dial-up. So, how high is high? Will we start installing ears on celestial bodies, as they orbit overhead? Maybe not, but other equally fanciful ideas are being considered now as possible replacements to the conventional land-based pole and dish. One enterprising company, SpaceData, is trying to extend cell-phone coverage by installing antennas in weather balloons. According to the company, these balloons will fly at stratospheric heights, above the travel lanes of commercial aircraft. Antennas broadcasting from such a lofty height would be able to cover an area fifty miles or more across. Yet as any little boy or girl knows, once you release a balloon’s tether, it is free—guided by wind currents until they eventually disintegrate. SpaceData hasn’t quite worked out the kinks in their design, but indicated that its balloons would be equipped with GPS, and that each balloon would be equipped with a mechanism that would jettison the cell antennas if it gets out of range; the antennas would then freefall by parachute to be retrieved later. As each new year brings another advance in technology, it can now be said practically that we can share information anywhere, with anyone, anytime. The Internet is no longer a destination; it is an all-consuming fog of bits and bytes that we stumble through as we walk the paths of our daily routines. If, as Johnson put it, today’s metaphor is the network, then tomorrow’s metaphor might be “data consciousness”—resulting from omnipresent access to every scrap of information. Spiritual leaders often talk about reaching a higher consciousness as they delve deeper into their devotional disciplines; we are heading towards a silicon-based consciousness, spread among the flash cards and hard drives of our phones and laptops, yet meshed together to form a shared memory. In fact, as technology gets smaller and more sophisticated, we will increasingly turn to biological vocabulary to describe its form and function, and to frame its development within a context we can understand. Words like cells, virus, immune systems and feedback have all found digital corollaries. It seems hard to believe that just twenty years ago, cell phones were a brick-sized novelty and letter-writing (not emails, text messages, or MySpace videos) was the preferred mode of communication. If the HOLA pattern continues to hold true, we will cycle through higher and higher pipelines of communication until there is no longer any delay whatsoever between ourselves and our information. It’s been said that information is the currency of the new economy; I believe it will become even more fundamental than that, as basic as a cup of water to a parched traveler, and as integral as the air we breathe. [i] From “Only Connect”, written by George Johnson in Wired Magazine, Issue 8.01, January 2000. This article can be read in its entirety at http://www.wired.com/wired/archive/8.01/nets_pr.html.